If you’ve ever used a fold-able windshield sun shade then you probably know how difficult it is to get it to stay up against the windshield where it belongs. 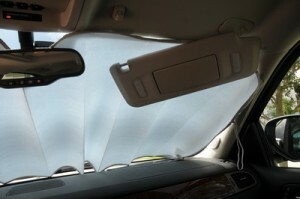 Before you get frustrated and give up on the sunshade try this simple trick I came up with to keep it in place. 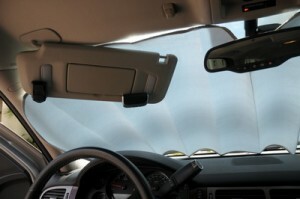 Almost every car has adjustable sundvisors that will rotate away from the windsield and even extend into the windshield when they are detached from their resting position. Your sundvisors will also double as a sun shield holder. Release the visor from tab that locks it into place on the end of the visor furthest from the window. Swivel the visor away from the windshield. 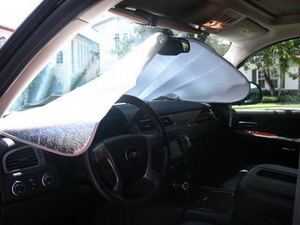 Now install the winshield sun shade and while holding the sun shade in place with one hand, swivel the sunvisor up against the sun shade to press and hold it into place. Do this with the sun visor on the passenger side and you will no longer have to worry about your sun shade flopping over as soon as you walk away from your car.